Drawing on the methods of textual and reception studies, book history, print culture research, and visual culture, this interdisciplinary study of James Thomson’s The Seasons (1730) understands the text as marketable commodity and symbolic capital which throughout its extended affective presence in the marketplace for printed literary editions shaped reading habits. At the same time, through the addition of paratexts such as memoirs of Thomson, notes, and illustrations, it was recast by changing readerships, consumer fashions, and ideologies of culture. The book investigates the poem’s cultural afterlife by charting the prominent place it occupied in the visual cultures of eighteenth- and early nineteenth-century Britain. While the emphasis of the chapters is on printed visual culture in the form of book illustrations, the book also features discussions of paintings and other visual media such as furniture prints. Reading illustrations of iconographic moments from The Seasons as paratextual, interpretive commentaries that reflect multifarious reading practices as well as mentalities, the chapters contextualise the editions in light of their production and interpretive inscription. They introduce these editions’ publishers and designers who conceived visual translations of the text, as well as the engravers who rendered these designs in the form of the engraving plate from which the illustration could then be printed. Where relevant, the chapters introduce non-British illustrated editions to demonstrate in which ways foreign booksellers were conscious of British editions of The Seasons and negotiated their illustrative models in the sets of engraved plates they commissioned for their volumes. Sandro Jung’s study of The Seasons is a fresh and stimulating history of the publishing and marketing of one of the most popular texts of the eighteenth century. But it is also far more than that. This book radically extends our understanding of the cultural and economic value of Thomson’s poem by investigating its visual readings and its complex cultural afterlife within and far beyond Britain as the poem’s imagery morphed across an astonishing range of visual arts, including engravings in books, prints, cartoons, ceramics, furniture, and music. The result is a persuasive demonstration of the intersections between technology, aesthetics, commerce, market, and reception. Here is the writing of a fresh new chapter in the scholarship of The Seasons. Consideration of print, paratexts, pictures, price, and pocket diaries all make for the richest contextualisation yet of the production and consumption of James Thomson's poetic masterpiece from its first appearance to the early decades of the nineteenth century. Sandro Jung's new book builds on the author's previous critical readings and considerably enhances our appreciation for his re-contextualization of Thomson's book-length poem . . . 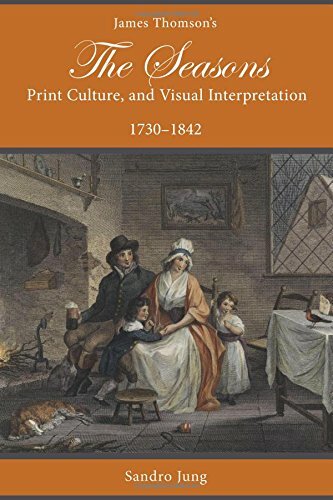 In this handsome volume, [he] provides accesible and sometimes provocative readings, demonstrating how print culture, plastic arts, and textile manufactures interpreted Thomson for generations of readers across social classes and national borders. What distinguishes James Thomson’s The Seasons, Print Culture, and Visual Interpretation, 1730–1842 and what will win it a broad audience is Jung’s salutary commitment to “reconnecting” book-historical inquiries to art-critical discussions of illustration or iconotext. . . . Fusing book history with art criticism to investigate the intersections of technology, marketing, and eighteenth-century poetic reception, Jung’s study promises to reshape the field of book illustration studies. Published as the inaugural volume in the author’s series Studies in Text and Print Culture at Lehigh University Press, this interdisciplinary and profusely illustrated monograph sheds light on an iconographic corpus that is as broad as it is complex: visual representations of James Thomson’s poem The Seasons. . . . Steeped in literary and book-historical theories, the refined prose of this monograph is surprisingly readable, and the wealth of illustrations generously included by the publisher renders it most enjoyable. Jung's momentous study represents a major intervention, if not a paradigm shift, in the field of eighteenth-century literature and culture. Focussing on the complex interactions between text and image, Jung has demonstrated that illustrations in any form are part of a "print-cultural archive" . . . Jung's stimulating study should stand as the definitive account of the multifarious visual responses to and reinterpretations of The Seasons. Jung personally provides the vast majority of figures in this generously illustrated study, and one of the greatest pleasures of his account lies in his ability, as an enthusiastic collector of the book’s editions, to supplement earlier accounts of the text’s impact and evolution from the vast reach of his personal collection. . . . it is the outward reach associated with paratextual elements that stands out most here: what Jung recounts certainly is about a close relationship between text and visual elements, but also is always about something more.